He could have easily avoided arrest. That’s something I never realized about the final night before Jesus’ crucifixion. But after traveling to Israel and walking down the Mt. 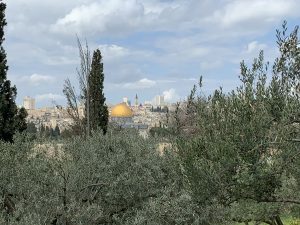 of Olives overlooking the city of Jerusalem, it was clear. A 15 to 20-minute walk would have taken Jesus right over the ridge of the mountain into the wilderness. Anyone could have hidden in the brush and caves on the other side long enough to wait out the danger at hand. But, Jesus didn’t choose this. He was in agony and deep sorrow over the task ahead of Him. His friends couldn’t stay awake to pray with Him, and one of His trusted disciples was about to deliver Him into the hands of Roman soldiers. Yet, He still chose them over His own safety, and He chose you and me. He chose to be fully obedient to God and die for us so we’d have hope on earth and hope for a life with Him for eternity. Sure, Jesus knew this would not be the end, but He also knew the amount of suffering ahead of Him. WHO would choose that for us? No one but the King of Kings and Lord of Lords. Our Maker and our Savior! 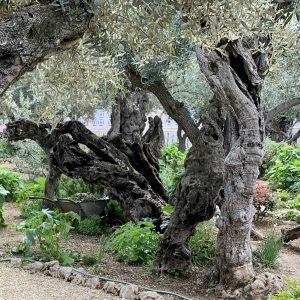 Interested in seeing the spot where many believe Jesus prayed in the Garden of Gethsemane on the Mt. of Olives and many more places important to our faith? Jeremy and I are going back to Israel in March of 2020 and would love to travel with you. Sign up for an informational meeting right here, or find out more about the journey right here!